I can’t use a webinar! It doesn’t work for my product! No one in my industry is doing it! If you ever needed confirmation that the Russell Brunson Webinar method works this is it. 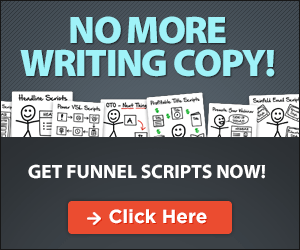 For quite a while now Russell and the team at Clickfunnels have had the perfect webinar secrets training. So while it is not new a lot of people simply didn’t know about it or didn’t understand it until now. If you are currently shouting but Russell did this one stage, that’s not a webinar you are right. That is one of the main problems most people make starting out. A webinar is just like your in-person sales process but it’s online. Russell is giving away the script he uses to promote anything. I thought it would help you in your business. I have it and use it in my business. You can get it for free he just asks you pay the shipping. It’s less than $5. Just thought you might like it. However, if you really want to take it to the next level grab Russells FREE book Expert Secrets and check out the special offers which will give you the Perfect Webinar script along with a host of other scripts, training, strategy and so much more. If you are not familiar with Clickfunnels it is an awesome set of marketing tools allowing you to build Sales funnels, websites, membership areas and automate you’re follow up marketing with Actionetics. Combine all of this with the scripts and strategies in Expert secrets to create a sales machine for your business.